A number of security devices may be used together with the electronic article surveillance systems to prevent theft in shops. 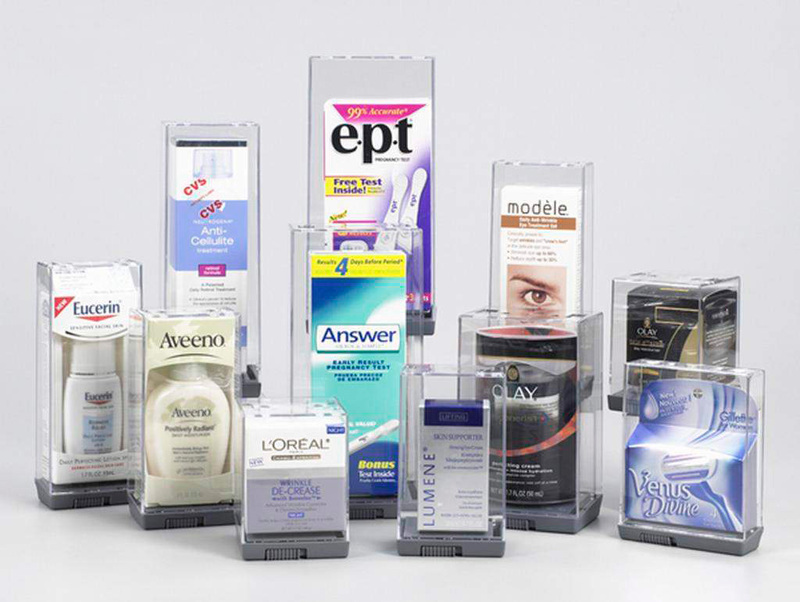 Protection is particularly important in the case of products that are small in size, sold in mass, or have a high price. Generally, shoplifters have an easy job with these. They only need to lift them from the shelves or stands. So, it is not difficult to steal these articles without anyone noticing it. Safers offer an ideal solution to protect such goods. Safers are transparent protective cases or containers equipped with a special lock that may be used to hold small-size articles. The lock must be opened to gain access to the product. By using safers, retailers may protect their small-size and high-priced goods from being stolen. Products such as batteries, cosmetics articles, mobile phones, CD’s, DVD’s, etc. can be contained in safers. This way, the products will still be visible to customers but are protected from theft. Safers are made of polycarbonate. Polycarbonate is a highly resistant material and protects against external mechanical impacts. It is practically unbreakable. Only the merchant with access to a key or proper equipment can open the lock installed on the safer, making the product impossible to steal. Nowadays, there is a wide variety of goods to be protected. Safers are effective with protecting small-size and high-value hand tools, drills or spare parts that are found in DIY stores, which are more prone to theft. Safers are used to actively prevent the theft of some non-prescription drugs or food supplements, cosmetics and perfumes. Safers also offer an ideal solution to protect smaller-size but high-value consumer electronic products, such as memory cards, connectors, telephones or batteries. Currently, close to 100 types of safers, in a variety of sizes, are used worldwide. Some of them are equipped with a simple lock that may be opened with a magnetic opener similar to hard tags, and there are also safers with installed double locks that are more difficult to manipulate. These safers may be opened with an oblong, two-point magnetic opener and represent a higher level of security. Safers may be positioned on shelves or hung on stands, according to the size or type of goods they hold. Safers should adjust to the size of the goods to be protected and be aesthetically appealing in their appearance. Contact us for further info on what type of safers are we selling currently.